Is gift wrapping paper recyclable? You’ve watched Blue Planet, you love turtles and you want to do your bit this Christmas to be eco friendly. But you are a bit confused by mixed messages about whether you should be using gift wrap, brown paper, newspaper or even wrapping presents at all this Christmas. 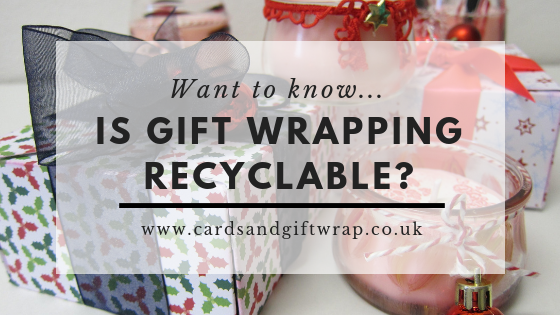 So I’ve put this little post together to help you answer the question; Is gift wrapping paper recyclable? Skip the waffle, show me where I can buy 100% recyclable gift wrap! A really quick test is the Scrunch Test but it’s not quite as simple as that. So which gift wrapping is recyclable? Probably not recyclable. Even if it doesn’t contain any glitter, foil or added extras, the thin wrapping paper that is often found at the checkout is unlikely to be accepted by paper mills for recycling as it contains few good quality fibres for recycling. The paper might be recyclable but the glitter and foil effects make it difficult and too expensive (if it is even possible) to recycle. At least the paper will biodegrade if put in general household waste but the foil and glitter additives might not. Yes, most probably recyclable, providing no glitter, foil etc is added. You can get recycled wrapping paper. However, there is a debate as to whether it is better to produce recycled paper or use virgin pulp from FSC certified sources as the recycling process itself is expensive and energy consuming. Another alternative could be using paper from easily replenishable sources such as bamboo that grows quickly. This shouldn’t be recycled but should go in the compostable bin along with brown cardboard but that’s ok. Good environmental option! Not so good if you want a pretty design as you’ll have to do one yourself and make sure any design you apply is also compostable! Check out my Pinterest board for some ideas. Use vegetable based inks to stamp the paper and add natural embellishments like twigs, flowers and berries that can also be composted. Yes, this wrapping paper is recyclable. One thing you might like to check is what inks are used in the print. Some companies use eco friendly vegetable based inks that do not harm the environment. Also check if the paper used is from FSC sources. All of the gift wrap in my Flamingo shop is 100% recyclable, uses vegetable based inks and is from FSC sources. If you are a designer looking to print your own gift wrap then there are UK print companies that have a very high standard of eco friendly printing like Ashley House. Before recycling or composting your gift wrap make sure you remove all sellotape, tags, ribbons, bows etc. Gift tags might be recyclable/compostable but the ribbon that they are attached often isn’t so make sure you remove it first. If in doubt, ask the company, they will know. Many gift wrap companies have an environmental policy like Flamingo Paperie. In fact all their gift tags, including the jute string, are 100% recyclable. Also wondering what Christmas cards to buy? You might be interested to know that all our Christmas cards are charity cards as well as being environmentally friendly. If you have any questions about joining my Flamingo Paperie team then you can ask anything directly to me. However, there are a few frequently asked questions about Flamingo Paperie that come up time and again so I thought I’d put them all in one post for you. My Top 10 Frequently Asked Questions about Flamingo Paperie. Are the products still the same quality as Phoenix? No, I’d say they are even better! We have made our gift wrap thicker and our cards are now all matt textured, which makes them look even more fabulous. The same amazing illustrators are designing our cards as well as new ones each time we launch a new range. We are always looking for more artists too. Can I make money at this? Yes! There are two ways to make money, selling and sponsoring. You make at least 20% on everything you sell. If you buy the stock yourself and sell it you make 30% profit. If you use your free ecommerce website that comes with your starter kit then you make 20% but you don’t have to do any stock handling. Of course you can do a mixture of both online and offline selling. The other way you can make money is by building your own team of Independent Flamingo Partners. We call this sponsoring. E.g. when you join my team and you sell products I get a bonus from the company for your sales. This doesn’t come from your profit and the sales profit you make is exactly the same as I make on my sales. However I get a ‘sponsor and support’ bonus for helping you grow your business. How much is it to join your team? There are three starter packs to choose from at £45, £95 and £200. Each pack contains a selection of stock, brochures, other sales aids, your public liability insurance and an ecommerce website. More exactly pack 1, £45, contains 30 cards (worth £60 retail), 25 brochures, 25 promotional leaflets, 1 order pad and 500 personalised address labels, public liability insurance and an ecommerce website. Pack 2, £95, contains 80 cards (worth £160 retail), 50 brochures, 50 promotional leaflets, 1 order pad and 500 personalised address labels, public liability insurance and an ecommerce website. Pack 3, £200, contains 200 cards and 5 gift wrap sheets (worth over £400 retail), 100 brochures, 50 promotional leaflets, 1 order pad and 500 personalised address labels, 250 ‘thank you’ business cards, public liability insurance and an ecommerce website. So each pack is worth more than it costs you and contains everything you need to start your business at whatever level you want to. Are there targets I have to meet? No. There are bonuses you can get if you sell a certain amount and if you build a team etc but there is absolutely no requirement from the company for you to do that. If you don’t want to, then don’t. If you want to make more money then you will want to set those targets for yourself but no one else is going to insist that you achieve them. It’s your business, it’s up to you. When you join my team I am here to support you in whatever way I can help. You can contact me by email, phone or online at any time and ask for whatever help you need. My team is part of a bigger team too and they are also there to support you. I have a team Facebook group where we have online meetings, people ask questions, share success stories and experiences. I am also developing a set of short videos to help with various topics that crop up frequently. However, it is up to you to make your business work. 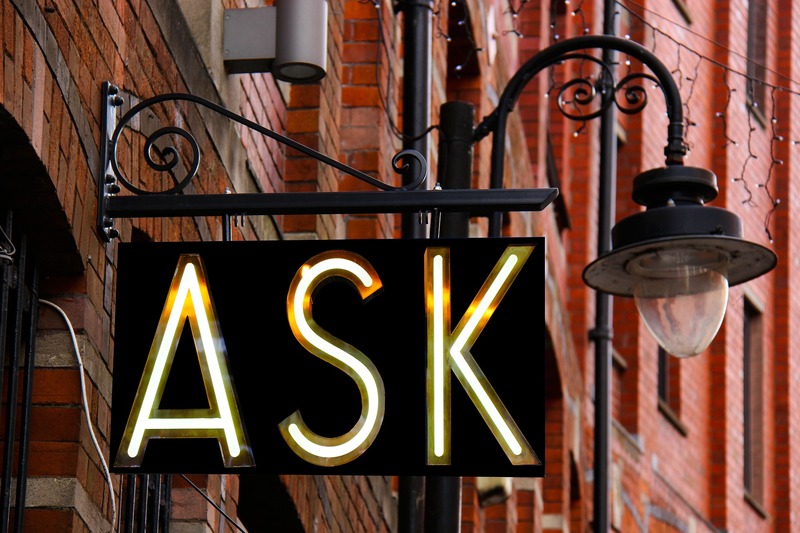 If you want to grow, ask questions. Of all the team members I’ve had the ones who are most successful with Flamingo are the ones who ask lots of questions! Can I sell other things alongside Flamingo cards? Yes absolutely. The great thing I have found about selling cards is that they go extremely well with other products to sell. If you’re selling candles for example, chances are people will be buying gifts and will need a card and gift wrap to go with it. You can offer the complete package! Where can I sell the cards? You can sell from your home, to your neighbour, to friends and family, work colleagues. Or sell at fairs and events. You could take a bag or basket of aards to work or a workplace staff room. Set up a Facebook business page and advertise your cards on there. Or have an online ‘pop up shop’ through your Facebook page. You can have a ‘pop up shop’ (where you take some cards and gift wrap along to show people). Do this in someone’s house, a toddler group or maybe a fundraising event. You can pretty much sell wherever you like. The only exceptions being you can’t sell through an online auction site (e.g. EBay) and you can’t sell to a retail outlet (but you could give them a basket of cards for their staff room). Isn’t it just a pyramid scheme? No. Pyramid schemes are illegal in the UK for a start! In a pyramid scheme someone sells something to you and you have to sell it for a higher price and so on until eventually the system cannot sustain itself. In Flamingo everyone buys cards at the same price and sells them at the same price for the same profit. I support you and get a support bonus from the company proportional to your sales but not from your profits. Think of shareholders in a corporate organisation who get bonuses when the workforce bring in extra money. With Flamingo if you sell more you make more profit and your sponsor (the person who’s team you joined) gets a bonus from the company’s profits. There are no shareholders! Unlike a traditional corporation you have the opportunity to earn more by selling more! The only way to join my team is online here. 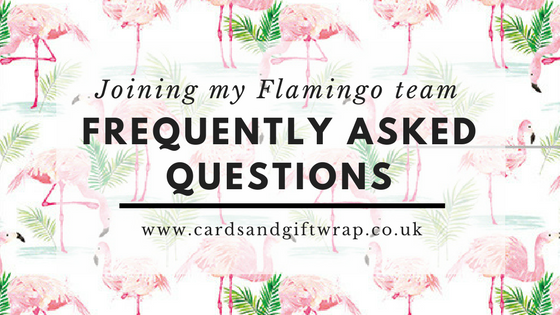 If you have a question that hasn’t been answered in my frequently asked questions about Flamingo Paperie. Or if you’d like a copy of the full reward plan then please ask me. No question is too small or silly! 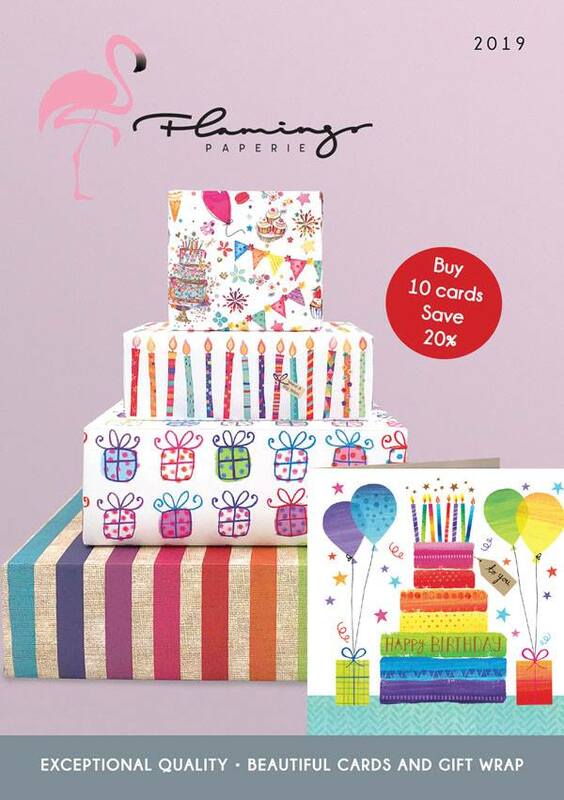 Other than the quality and affordability, which Flamingo cards and gift wrap has in abundance, what makes them any different to other greeting cards on the market? In short – what’s special about Flamingo Paperie? All Flamingo gift wrap and gift tags are recyclable, 100%! That’s quite something in a day where there is still a myth spread on social media that only brown paper can be recycled. The gift tags all have jute string ties and jute is totally biodegradable and therefore compostable. What about the cards? Good question! All the greeting cards without effects added are 100% recyclable. Until now the glitter on some of the cards wasn’t environmentally friendly but Flamingo have just launched the first cards with eco-friendly vegetable based glitter. now with eco-friendly, vegetable based glitter! It’s unclear whether foiled cards are recyclable or not. Many recycling plants won’t accept them but there is some research done by interested parties to suggest that this might be unnecessary. ALL Flamingo Christmas cards, including the advent calendar cards are charity cards. If you want to know more about that then I wrote about it in a bit more depth here. Flamingo Partners, like myself, got to choose which charities would benefit in 2018 and we chose Macmillan Cancer Support, Together for Short Lives and the Alzheimers Society for UK donations. You can read more about Flamingo’s charity here. Have you ever seen or bought a greeting card after liking the image on the front only to wonder who created it? You turn over the card and all you see is ‘Made in China’. Not so with Flamingo! Flamingo are proud to promote each and every one of the artists who design for them. And if you read their profiles the artists are pretty pleased to supply Flamingo with their designs. Flamingo Paperie are a design led company and are always looking for new artists. If you have something to offer, it could be your name on the back of the next new Flamingo greeting card. You could be part of a very special Flamingo too! Become a Flamingo Partner and be part of something special today! Running your own business and need to compliment your products with cards and gift wrap? Needing a little extra income? Looking for something flexible that you can shape to fit your lifestyle? Someone who loves cards, gift wrap, stationery, Christmas and all things glittery!? If you’d just like to get your hands on these charitable, ethical and desing led cards and gift wrap then you can buy them from my Flamingo shop. Shop now and find our what’s special about Flamingo Paperie. Easter cards why do we send them? When was the first Easter card sent? According to Wikipedia people sent the first Easter cards just over 100 years ago at the very end of the 19th Century. At this time people tended to send postcards. Initially you could only write the address on the back of the postcard, along side the stamp. Postcard senders had to write on the front meaning that the illustration had to allow space for the writing. This changed in the early 1900s when the back of the postcard was split more like we see today. What sort of cards did Victorians send? Early images on Easter postcards and cards included the Easter bunny, sheep, flowers, eggs and often young girls who were a symbol of luck and hope. Easter carries a message of hope and new life so now we also might include butterflies and spring images, particularly in the Northern Hemisphere where Easter and Spring coincide. In Australia you might find an Easter Bilby instead of a bunny. It’s generally accepted that the Easter bunny originated in the 1700s in Germany. He was originally an ‘egg-laying hare’. German Lutherans took the tradition to America with them. Then, like so many things, once the Americans are doing it, we’re all doing it! What are Easter cards all about? There’s no doubt that Easter cards have their origin in Christianity. Relating to Jesus’ resurrection and the hope of new life, this is where most of our Easter images have their basis. It’s understandable that Easter cards were at their peak during the First World War. Then also the Second World War as people faced life and death situations and an uncertain future. Following the Second World War Easter cards declined and fewer are sent now than then. However, they are still very popular. With Mothers Day just 3 weeks before Easter it’s interesting to note that Mothers Day is the third largest card sending occasion in the calendar year, with Easter in fifth place. Why send an Easter card? Whether you are a Christian or not, sending any card at any time can lift someone’s spirits. There is a reason why the Greeting Card Association has as it’s industry tagline ‘send a card, deliver a smile’. That’s exactly what sending a card can do. While Easter may move its date each year it will always fall in Spring here in the UK. After an often cold, harsh winter here in the Outer Hebrides I know I love to see cards with flowers, animals, butterflies and eggs, heralding a new season with summer not far away. Whatever your faith or none, an Easter card can bring hope and encouragement in tough times. Or perhaps just a reminder of what a beautiful world we live in. So go on, make someone smile and send a few Easter cards this year! If you’re looking for other ideas for Easter then I’ve made some suggestions here. If you’re a busy person who’s a bit short of spare time to choose some Easter card then I’ve put together a bundle for you.